The Indian Ocean has immense strategic and economic value, due to trade and commercial activities. However, maritime crime which includes: piracy, human, drug and weapons trafficking have posed a threat to safe navigation of the seas. A Stimson Institute study (2012) on maritime security challenges in Indian Ocean region identifies the following: it is “multiple sources of insecurities within countries that had led to crimes by way of sea such as terrorism in Pakistan, Sri Lanka and India, Inter-state conflict in Persian Gulf, state failure, insurgency and famine in Yemen, Iraq and Somalia which had led to illegal weapons smuggling into these regions, maritime terrorism to loot and plunder vessels, human and drug trafficking to gain income to finance wars” etc. 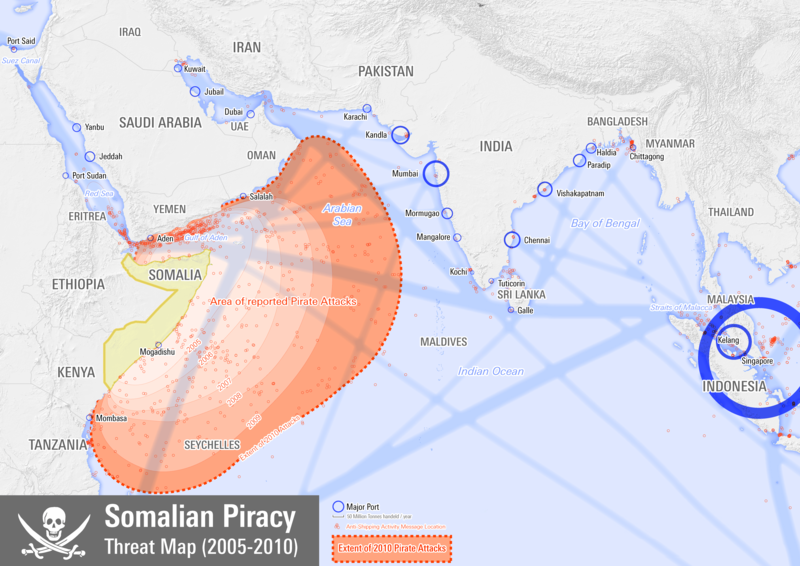 Maritime piracy as a crime is not isolated to the Somalia waters but is an issue in the South China Sea, the straits of Hormuz, Malacca and Gulf of Guinea in the Indian Ocean. While efforts of EUNAFVOR and NATO have reduced piracy attacks, the dangers are still present. It’s analyzed herein whether maritime piracy is a sufficient enough threat in the Indian Ocean Region and the need to ensure the seas for safe passage through multilateralism. The Indian Ocean is the world’s third-largest body of water with 50% of trade traversing the region covering approximately 20% of the water on the Earth’s surface. The Indian Ocean covers at least one fifth of the world’s total ocean area with highly strategic waters including: Western Indian Ocean, India’s coastal waters and the Bay of Bengal. According to the Council of Foreign Relations (2016) “more than 50 percent of the world’s maritime oil trade is found in the Indian Ocean Region, which itself is believed to be rich with energy reserves while nearly 40 % of the world’s offshore petroleum is produced there”. The economic significance of the Indian Ocean is of immense value to all countries that are traversing it for business purposes. Petroleum is used for energy generation and to run a wide range of industries worldwide. Maritime Crime, which includes maritime piracy, has significantly endangered safe passage of the seas; this poses a threat to trade and commercial activities. British naval expert Geoffrey Till asserts “if the postmodern age is dominated by globalization everything that supports globalization such as trade and energy deposits are fraught with competition and when it comes to trade routes 90% of all commercial goods travel by sea” Amidst such a backdrop of competition, Kaplan (2015) opines with reference to the disputes in South China Sea that peaceful seas may not remain so in the future. Kaplan has also pointed out that nationalism in States lead to modernization of militaries (navies, air force) to defend sovereignty and make claims for disputed maritime resources. To prevent escalation of conflicts, a balance of powers is necessary. Multilateral engagement at regional or international level is needed to overcome the “threat” (maritime crime constituting impunity at sea) which to a significant extent depends on military might or hard power approach. Multilateralism has potential to achieve a balance of powers because decision making in multilateral institutions are consensus based. In conclusion it remains that rules based governance (multilaterally sanctioned) is now a necessity. Verlaan, P., Morgan, J. and Kanayev, V. (2018). Indian Ocean. [online] Encyclopedia Britannica. Available at: https://www.britannica.com/place/Indian-Ocean [Accessed 1 Jun. 2018]. Albert, E. (2016). Competition in the Indian Ocean. [online] Council on Foreign Relations. Available at: https://www.cfr.org/backgrounder/competition-indian-ocean [Accessed 1 Jun. 2018]. See “Somali pirate attacks in the Indian Ocean (2005-2011): Evolution and Modus Operandi”- This study used data from four sources: International Maritime Bureau, National Geospace Intelligence Agency, International Maritime Organization and data from EU NAFVOR Atlanta operation to make observations. This study suggests that the international institutional regimes on piracy are incongruent due to lack of accurate reporting and also how the crime is identified by each organization following different understandings of what constitutes piracy. See: Vespe, M., Greidanus, H. and Alvarez, M. (2015). The declining impact of piracy on maritime transport in the Indian Ocean: Statistical analysis of 5-year vessel tracking data. Marine Policy, 59, pp.9-15. See: The Maritime Executive. (2015). Indian Ocean Piracy Suppressed. [online] Available at: https://www.maritime-executive.com/article/indian-ocean-piracy-suppressed#gs.e3Iuj78 [Accessed 3 Jun. 2018]. See: Michel, D., Sticklor, R., Herbert-Burns, R., Antrim, C., Fuller, H. and Dolan, L. (2012). Indian Ocean Rising: Maritime Security and Policy Challenges. [ebook] Washington DC: Stimson Institute. Available at: https://www.stimson.org/sites/default/files/file-attachments/Book_IOR_2_1.pdf [Accessed 4 Jun. 2018]. See: Kaplan, R. (2015). Asia’s Cauldron: The South China Sea and the end of a stable pacific. 1st ed. New York: Random House USA Inc.